The Grand National takes place Saturday, April 6th, at Aintree Racecourse in Liverpool, England. The famous steeplechase race is one of the most bet on horse races worldwide each year. Betting is a huge part of the culture of the Grand National with many people who don’t normally bet, getting action on the race each year. Even here in the United States there’s plenty of betting action on the race. On this page I will look at the odds for the 2019 Grand National from Bovada.lv, our top rated betting site for Americans looking to wager on the race. I will also provide a 3 step guide you can follow to get your bets placed on this years Grand National from anywhere in the United States. Here are the fixed odds for this years Grand National from Bovada. These odds are from a couple weeks before the race, so the field and odds could change leading up to the race. To see the up to date odds head over to Bovada.lv, click ‘Horses’ from the top menu bar and select ‘Grand National 2019’ from the Quick Links section. **These futures odds use the fixed odds format, so the odds are locked in when you make the bet. If you bet on race day in the Bovada racebook the odds will use the parimutuel betting system. Tiger Roll, the defending champion, is a big favorite at odds of +400. These are very short odds for a race like the Grand National where anything can happen. To compare, last year the biggest favorite had odds of 10/1 (+1000). This is generally anyone’s race to win. Follow these three steps to get your bets placed on the Grand National if you live in the United States. Click the above link and fill out the pop up form on the homepage (or click ‘Join’ in the top right corner). Bovada offers early fixed odds on the Grand National, and will be offering parimutuel odds on race day. They have a slick and easy to use racebook, and are one of the most popular betting sites serving the United States market. After logging into your account click on ‘Deposit’ and select one of the deposit options (Visa, MasterCard, Bitcoin). Follow the instructions to complete your deposit. Bovada offers all new players a 50% matching bonus up to $250. You can claim this bonus in the ‘My Rewards’ section of the site. Click on ‘Horses’ from the top navigation bar to go to the racebook. 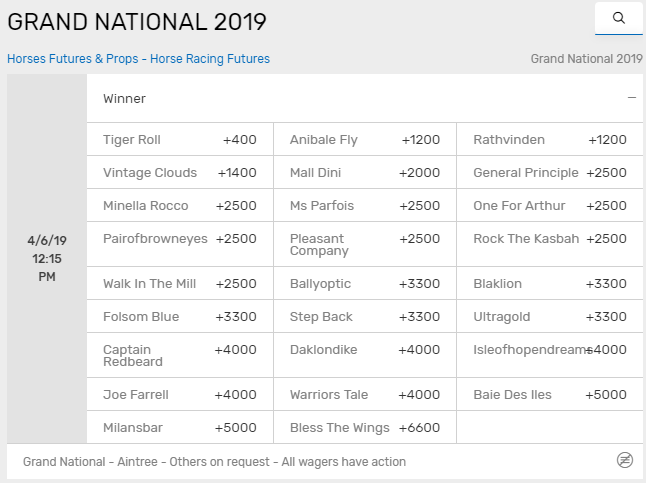 If you’re betting before race day you can select ‘Grand National 2019’ to see the fixed odds for the race winner in the sportsbook. If you’re betting on race day open the ‘All Tracks’ drop down menu and select Aintree Racecourse. From here you can place win/place/show and exotic bets on the Grand National. Check out our horse racing section for more information on the different bets you can make on the race. We also have a dedicated Grand National betting information page where you can learn more about the race.